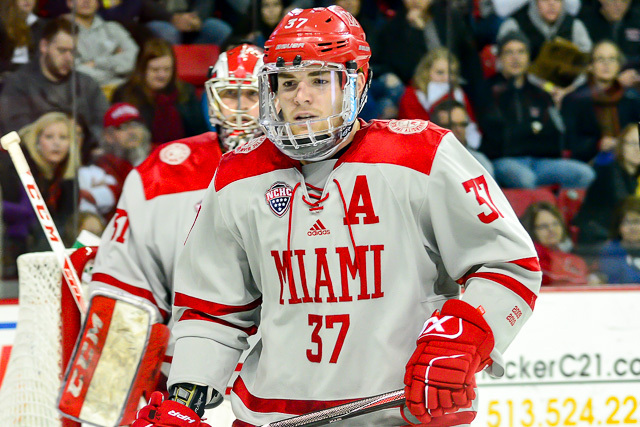 There’s no leaving early at Miami games this season. 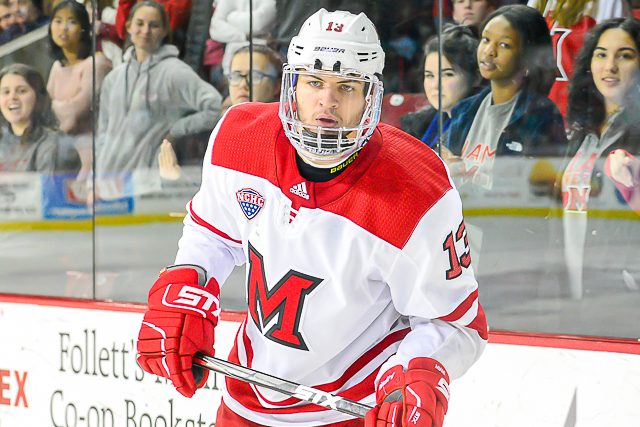 For the second time in eight days, the RedHawks scored with an extra attacker late in the third period as they salvaged a 3-3 tie vs. No. 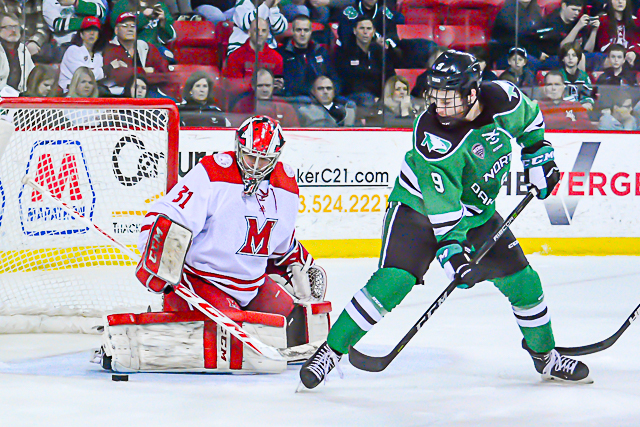 2 North Dakota at Ralph Engelstad Arena on Saturday. 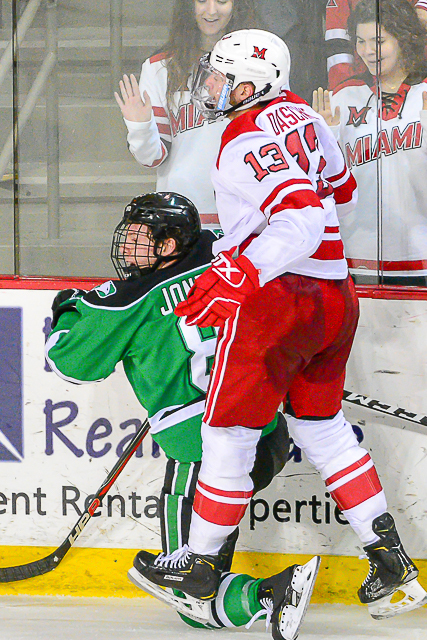 And once again it was Josh Melnick rallying Miami. 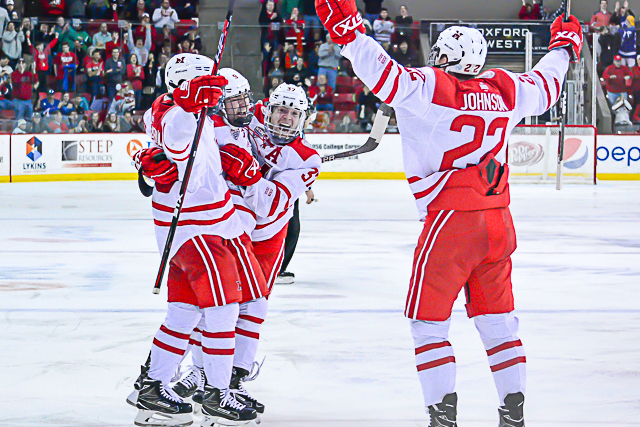 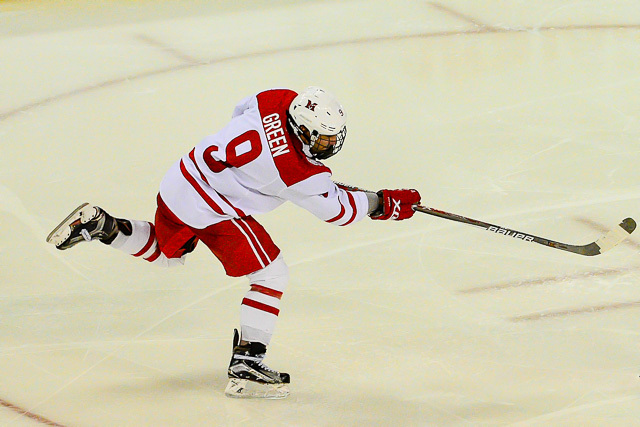 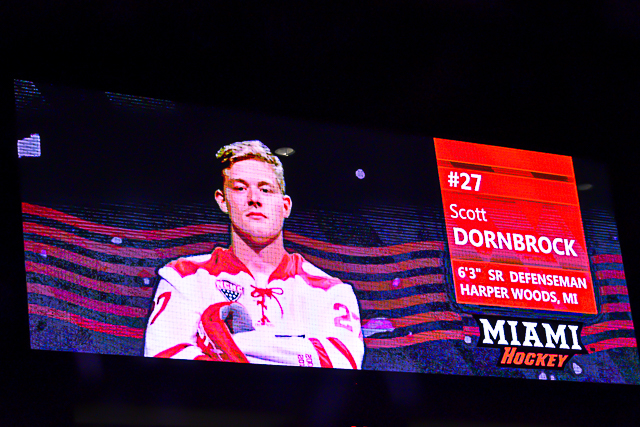 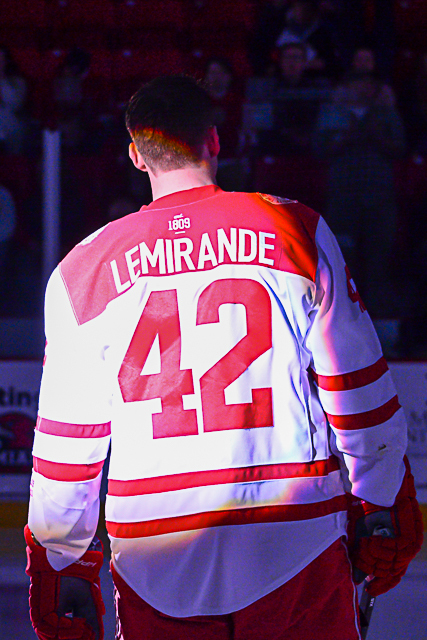 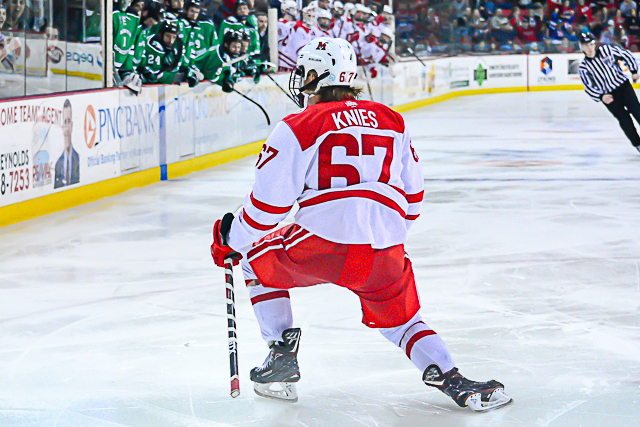 He scored the overtime winner on Nov. 3 vs. Colorado College. 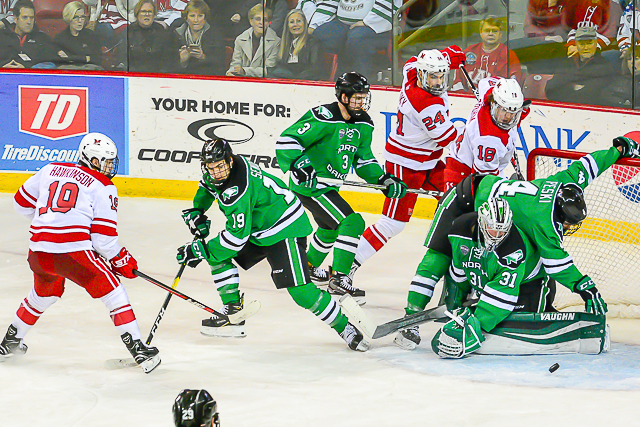 This time he evened it up with 1:24 left, sending the game to the extra session, a 3-on-3 and eventually a shootout, the latter of which Fighting Hawks won and earned an extra conference point. 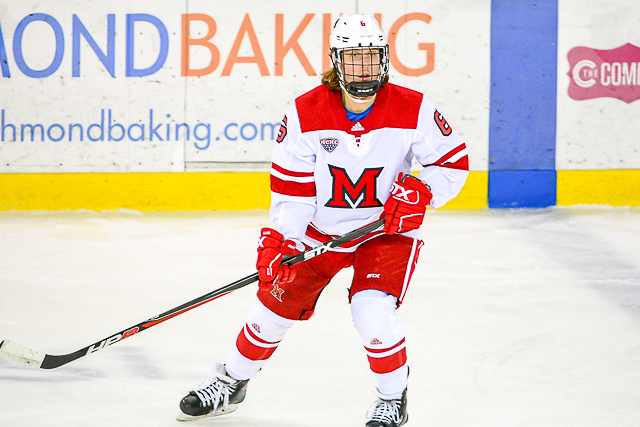 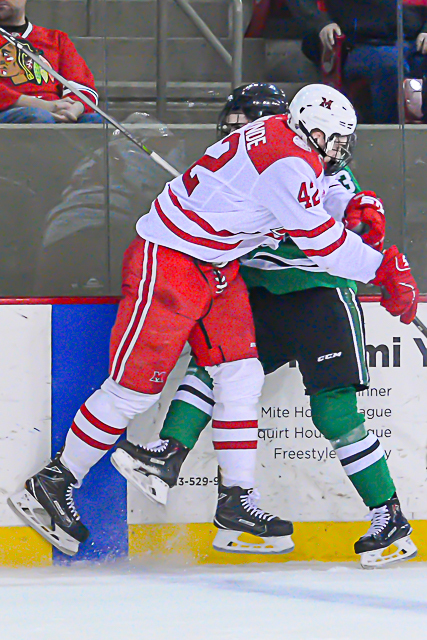 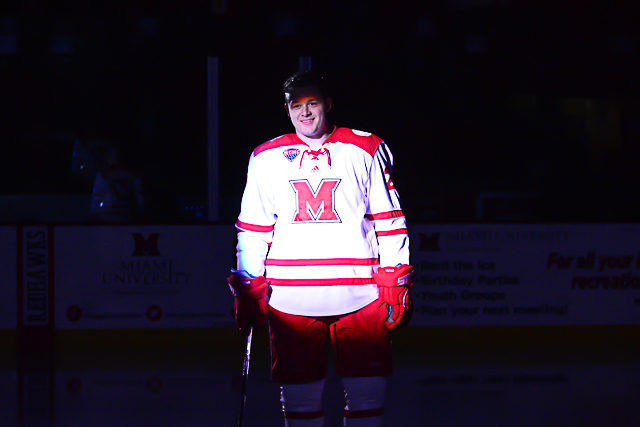 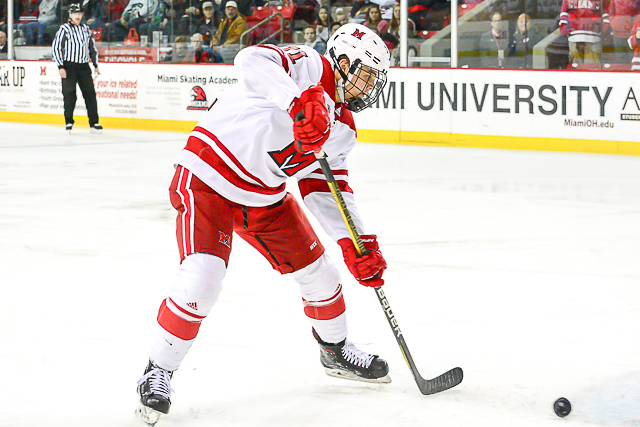 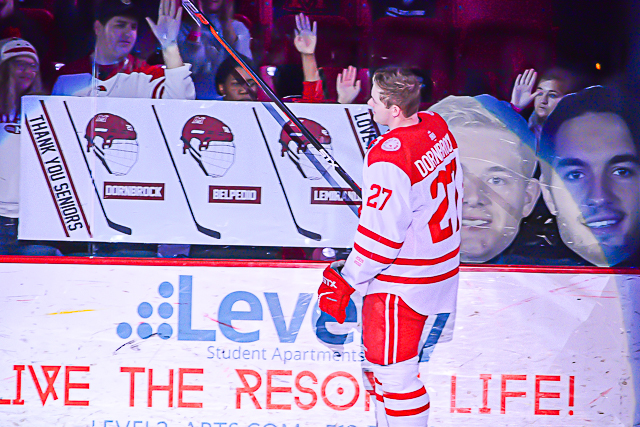 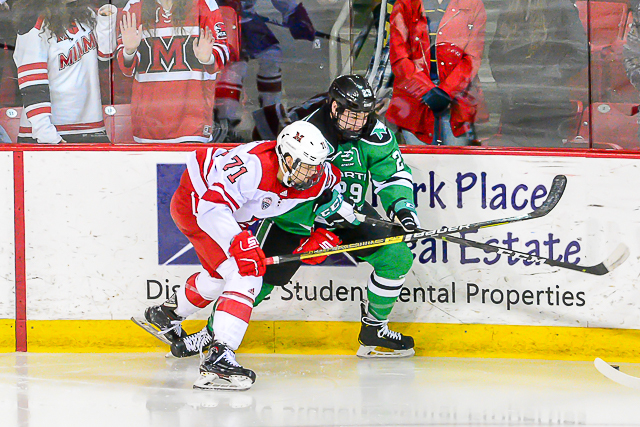 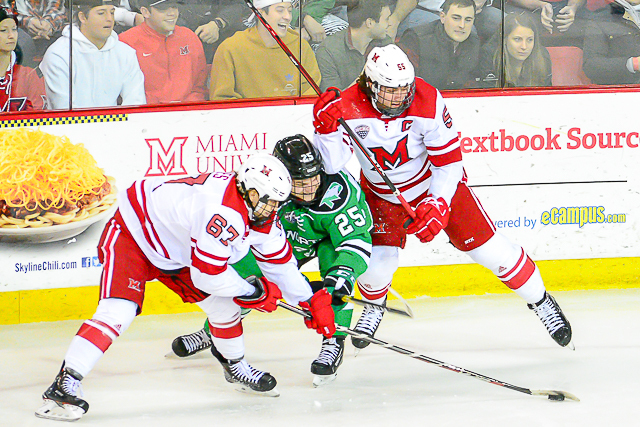 The RedHawks managed one of a possible six points on the weekend, as they lost on Friday. 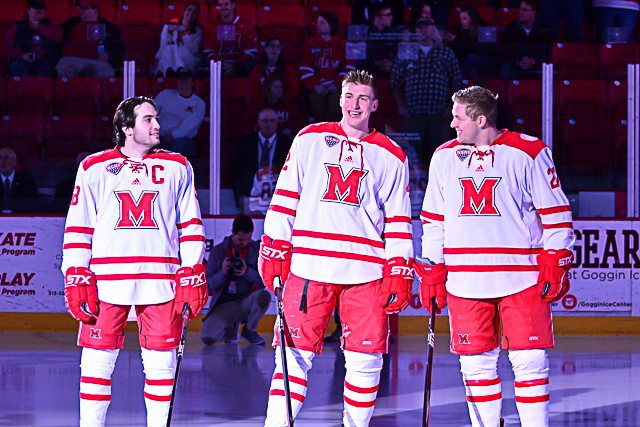 They dropped to 0-8-3 in their last 11 conference road games. 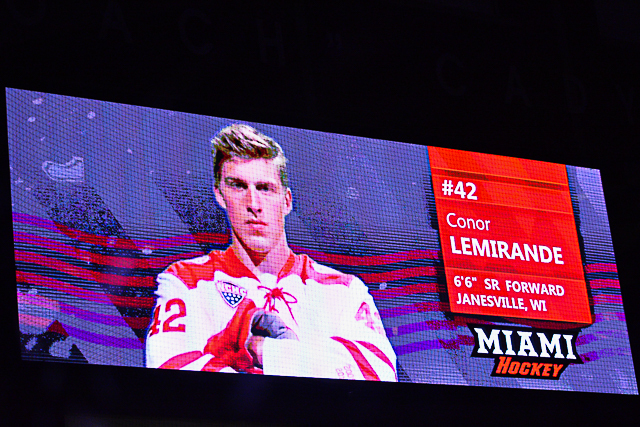 Miami actually led, 2-0 in this game. 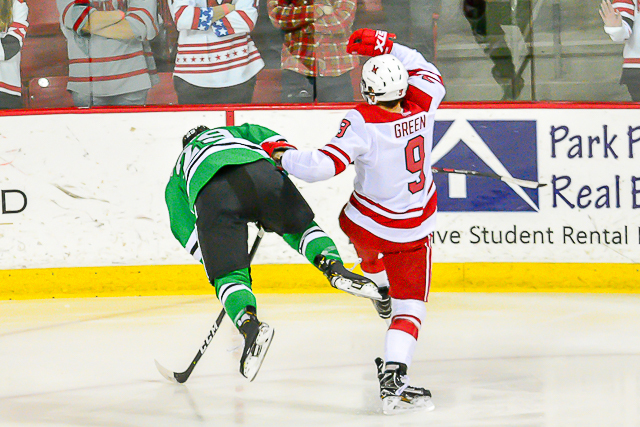 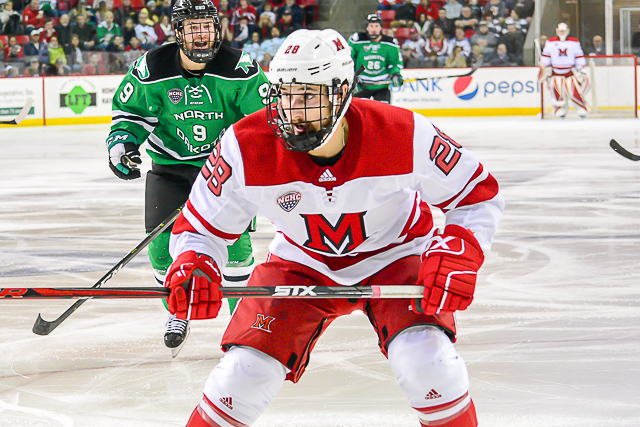 Gordie Green put the RedHawks ahead when he took a feed from Josh Melnick, turned and fired it in from the high slot with 3:53 left in the first period. 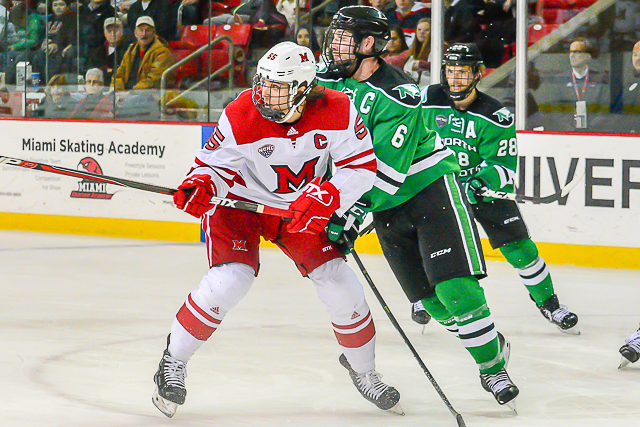 MU went up by two when a rebound off a blue line blast from Grant Frederic kicked out to Ryan Siroky, who shoveled it in off his backhand from the side of the goal eight minutes into the middle stanza. 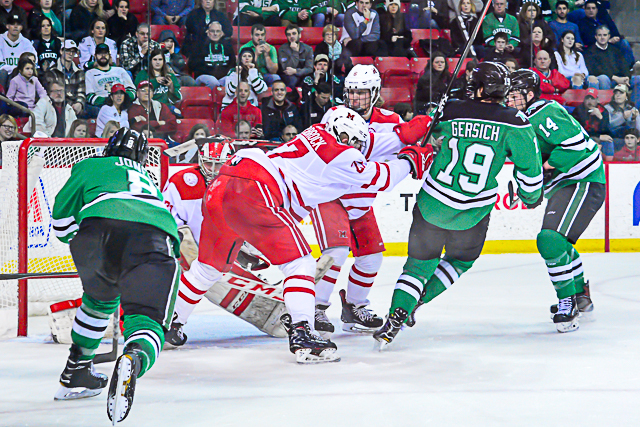 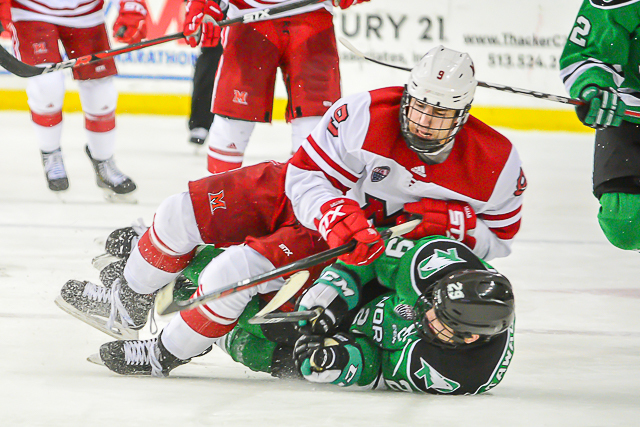 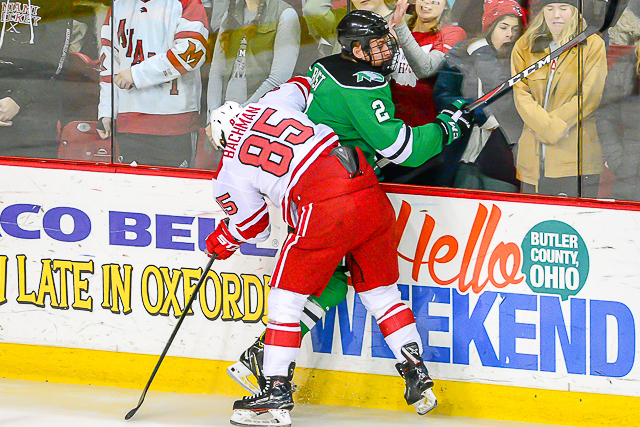 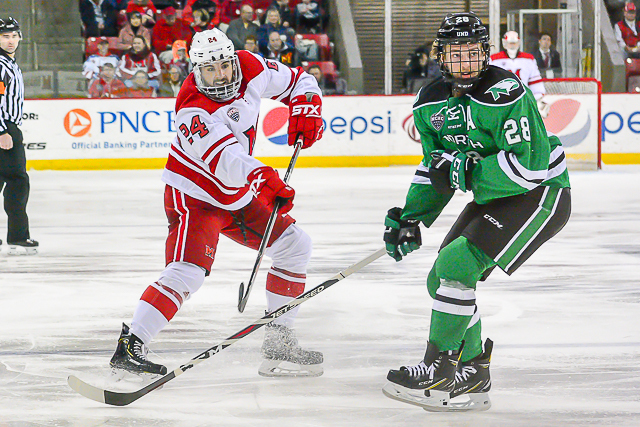 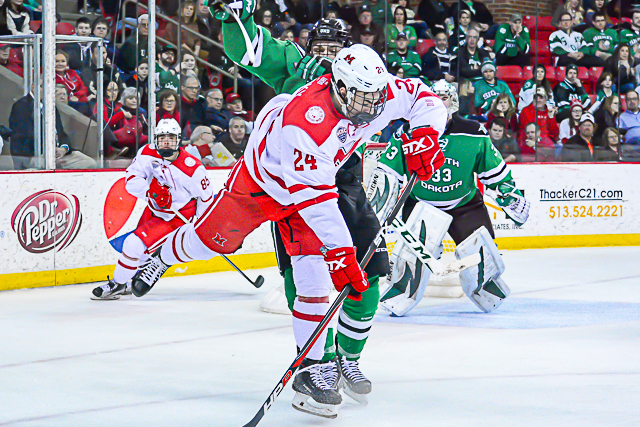 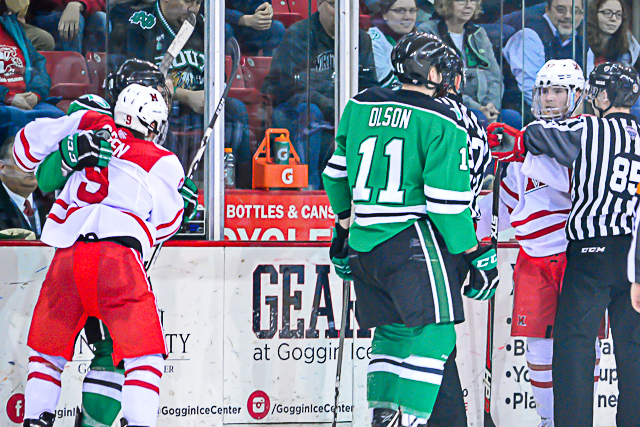 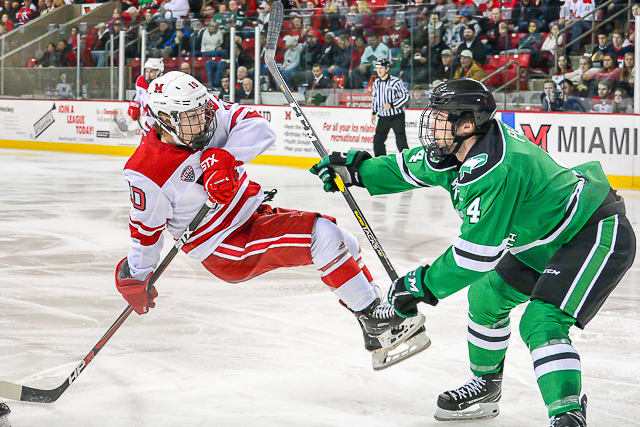 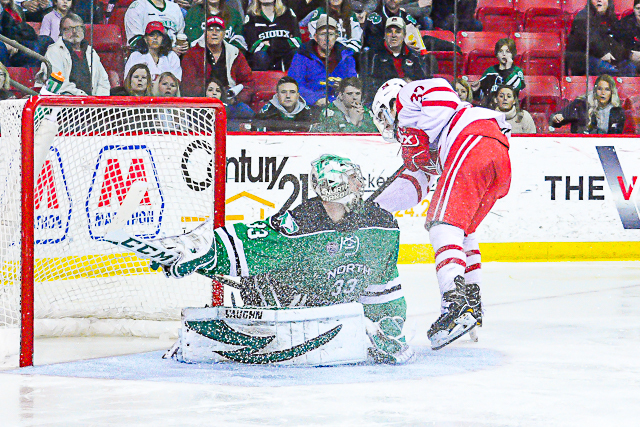 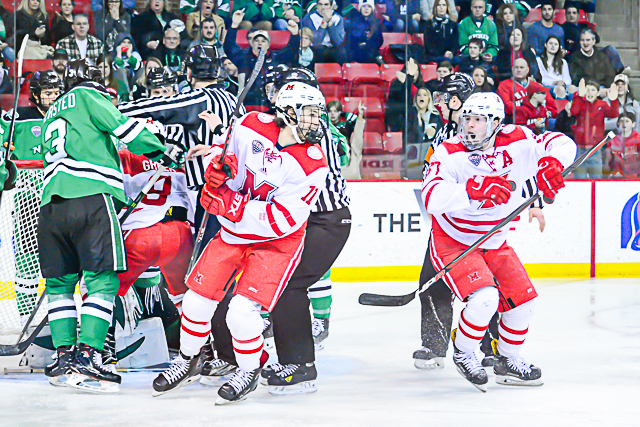 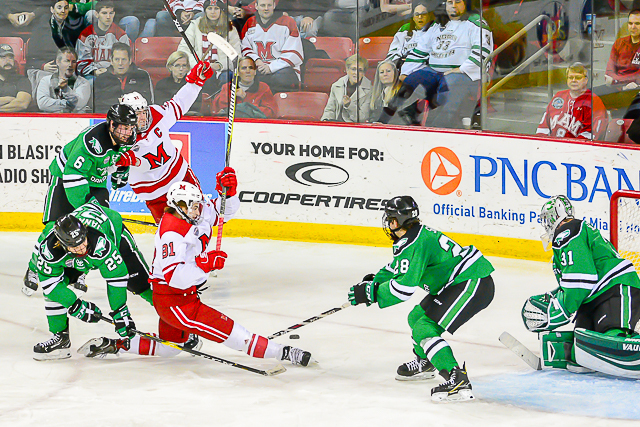 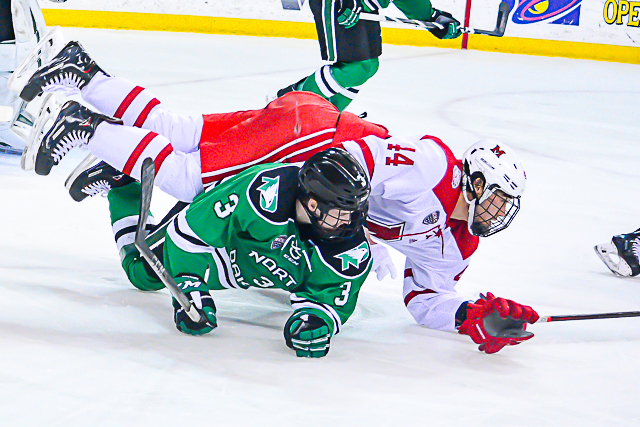 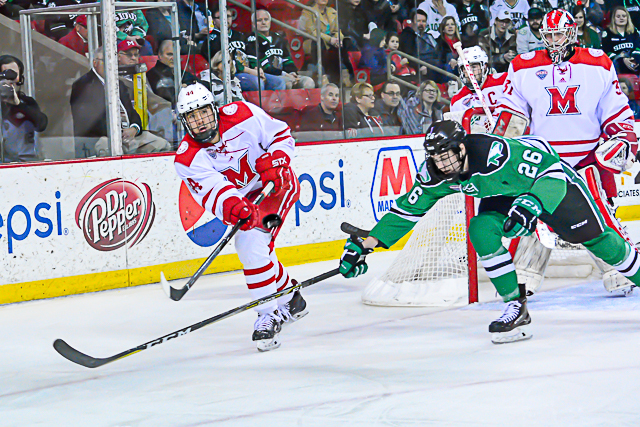 But North Dakota (7-2-3) answered 37 seconds later when a rip by Colton Poolman from just inside the zone deflected off a RedHawks defender and in. 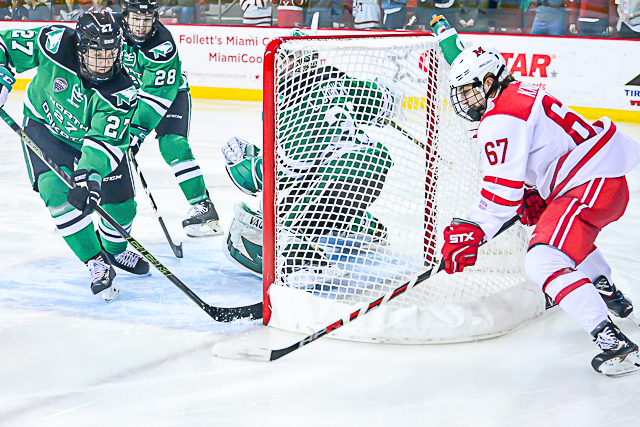 The Fighting Hawks evened it up 33 seconds into the third period when Dixon Bowen skated into the zone and fired one past Miami goalie Ryan Larkin from the top of the faceoff circle. 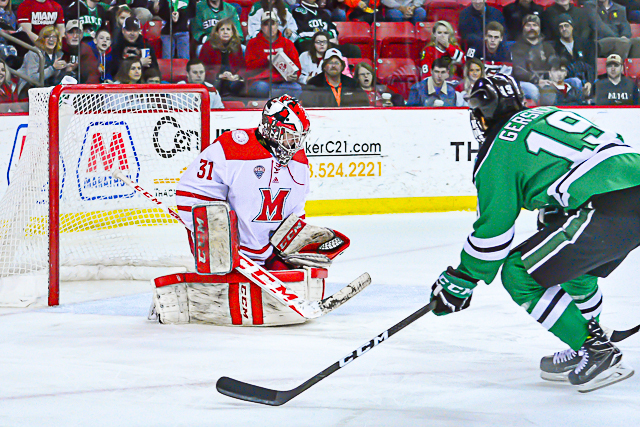 UND went ahead, netting its third straight goal, with just 3:38 remaining. 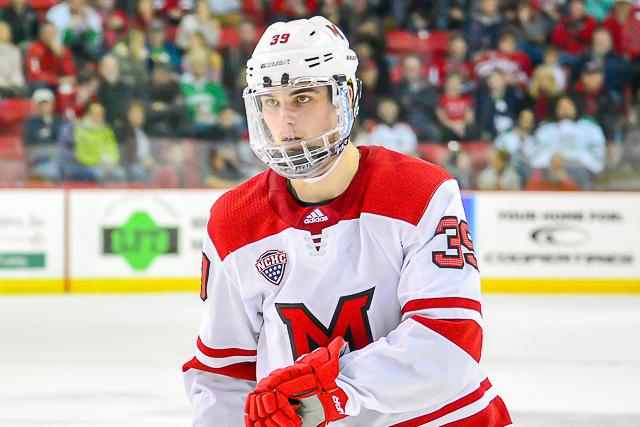 Grant Mismash was left alone for a brief 2-on-0 with Larkin but went behind the net when Larkin closed down his shooting lanes. 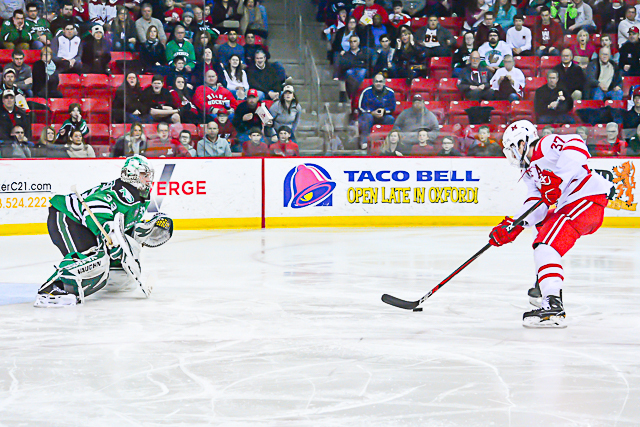 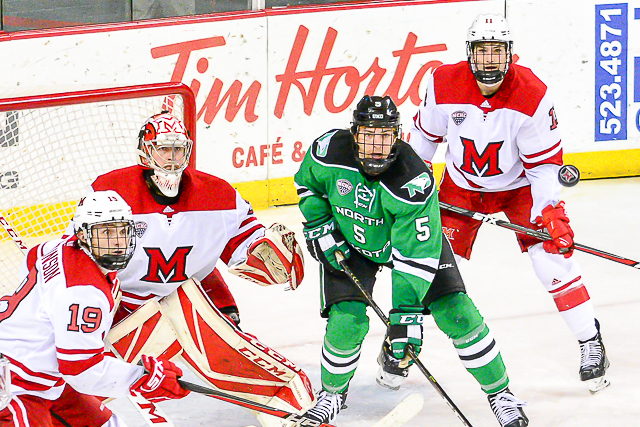 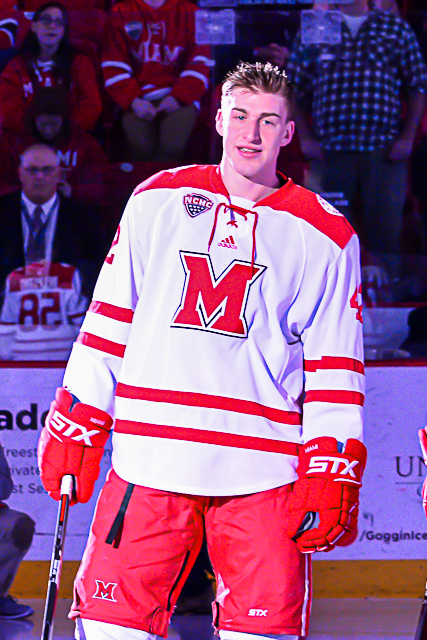 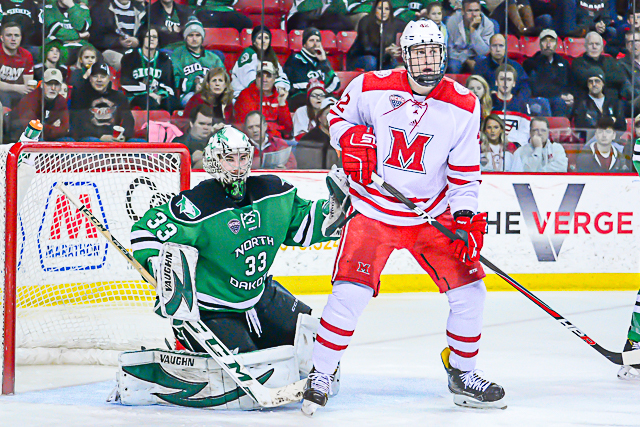 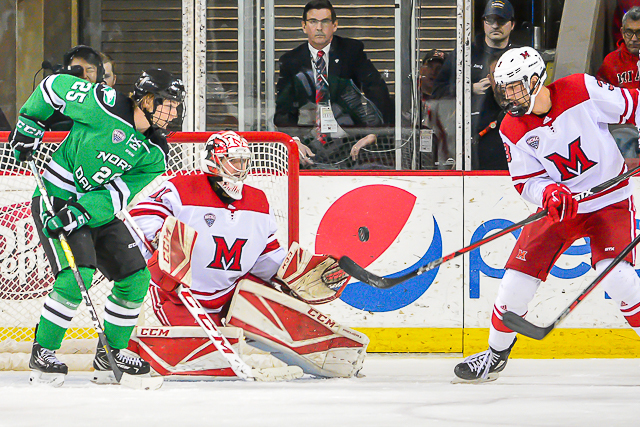 At a terrible angle, Mismash was somehow able to lift a pass to the other side of the crease for Shane Gersich, who batted it out of the air and into the net. 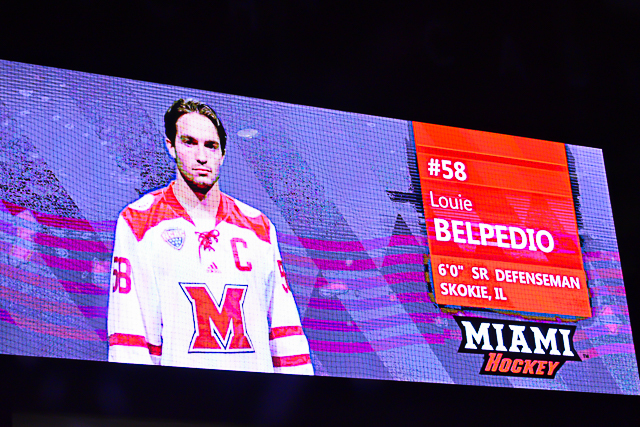 Down 3-2 with time running out and in front of nearly 12,000 UND fans, Miami defenseman Louie Belpedio somehow completed a slap pass through heavy traffic to Melnick at the inside edge of the faceoff circle. 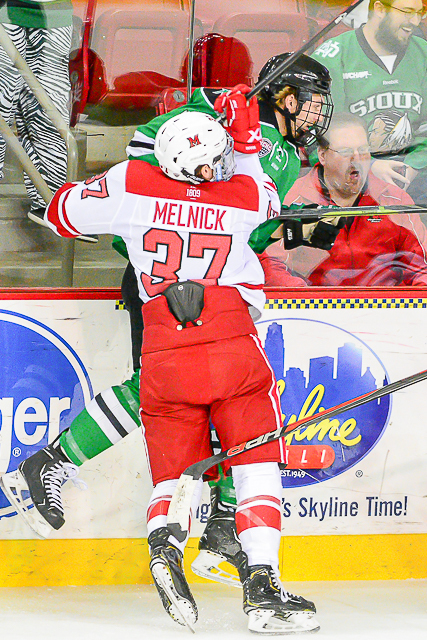 Like Siroky, Melnick hit twine with the backhand. 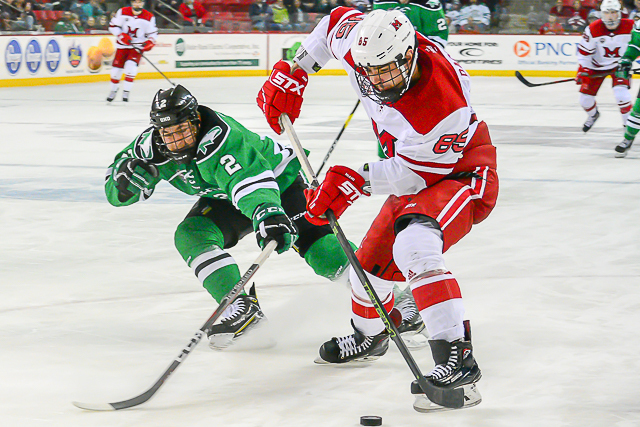 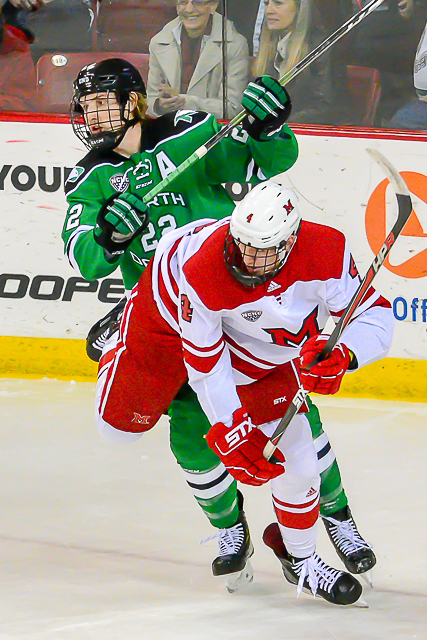 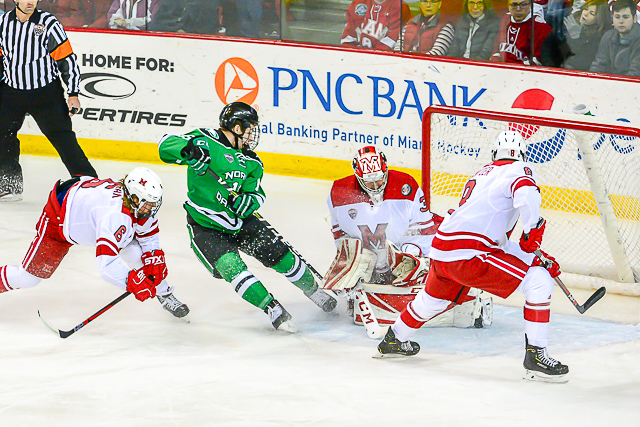 Melnick nearly won it in the closing seconds of regulation, but the game went to overtime, during which the Fighting Hawks outshot Miami, 4-2. 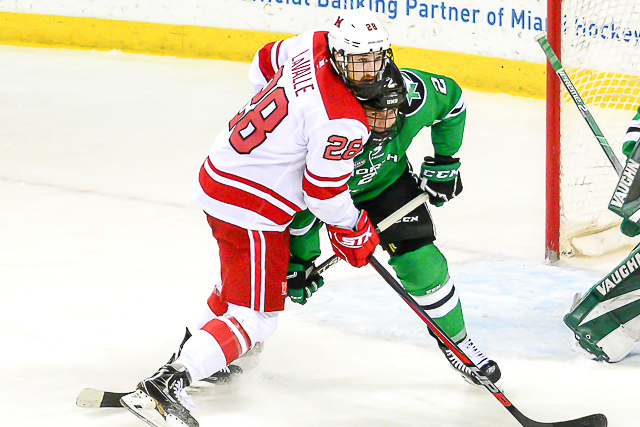 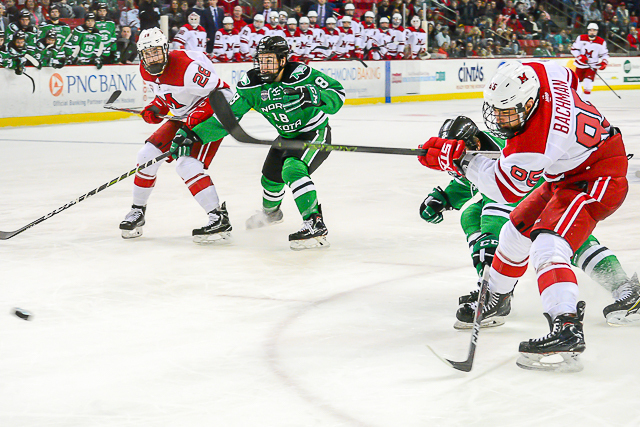 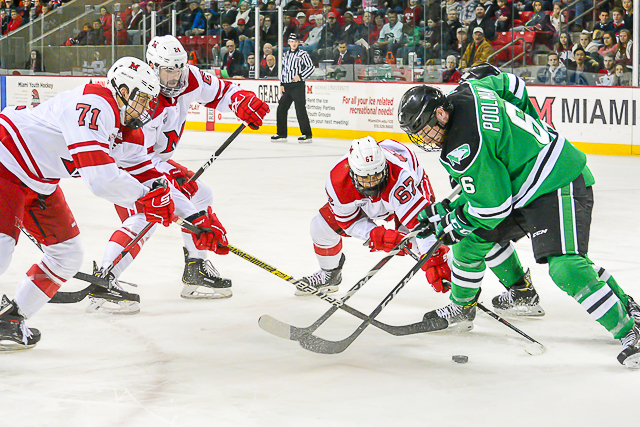 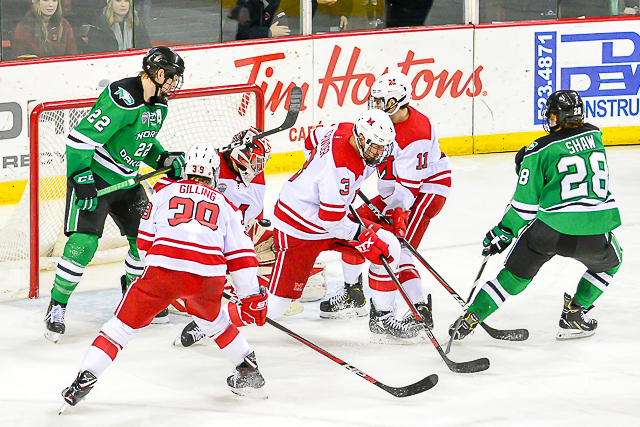 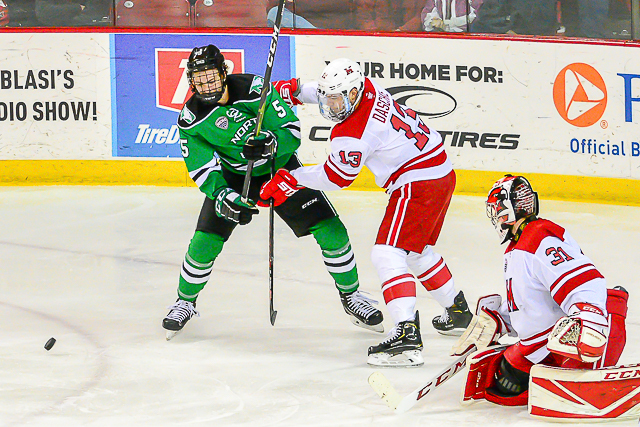 With the game officially recorded as a tie, the teams skated to a scoreless five-minute 3-on-3, and finally Christian Wolanin scored in the fourth round of the ensuing shootout to give UND an additional point in the NCHC standings. 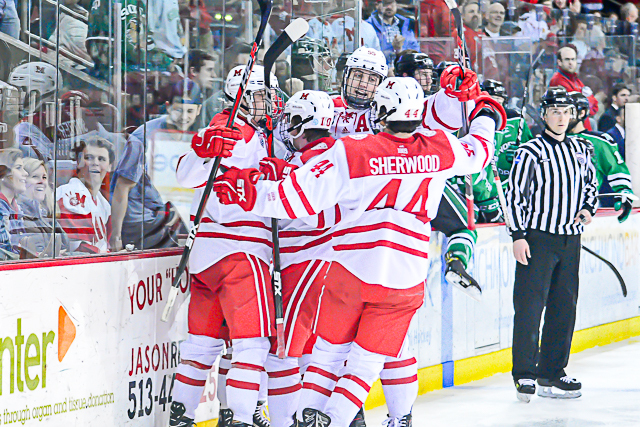 It was the first league game this season that had advanced beyond standard 5-on-5 overtime. 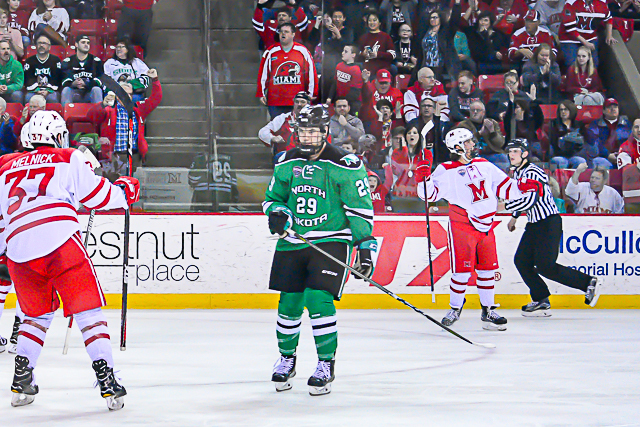 Miami received one point for the tie and the Fighting Sioux two for the tie plus shootout win. 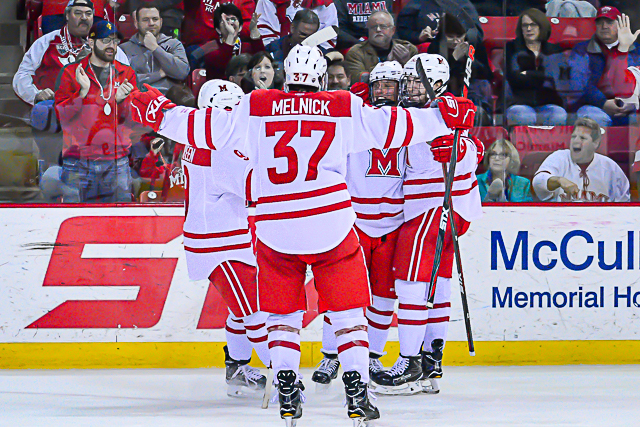 Melnick was the lone RedHawk with multiple points, accomplishing that feat for the third time this season with a line of 1-1-2. 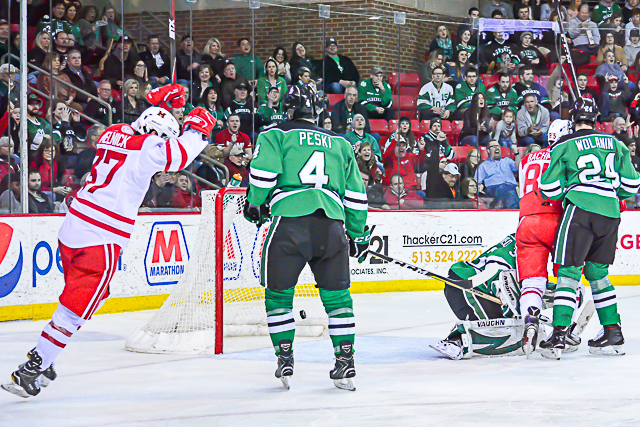 Green is now tied with Grant Hutton for the team goal-scoring lead with five, and Melnick has three – all in the past five games. 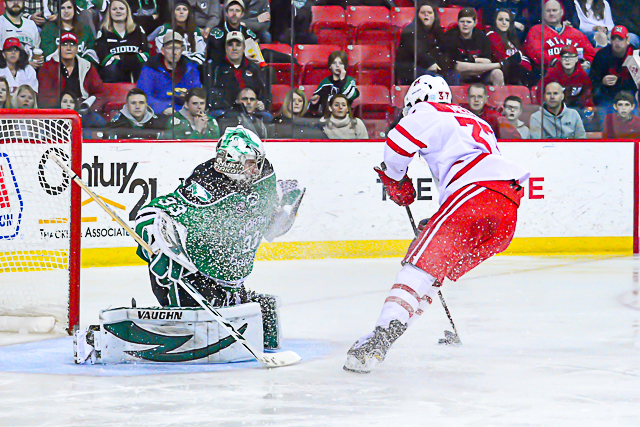 Siroky’s marker was his first of the season. 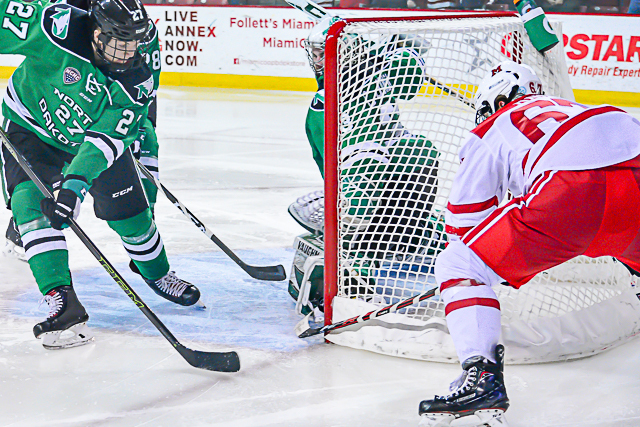 It was the third time in 2017-18 a Miami game was decided in the final two minutes of regulation or overtime. 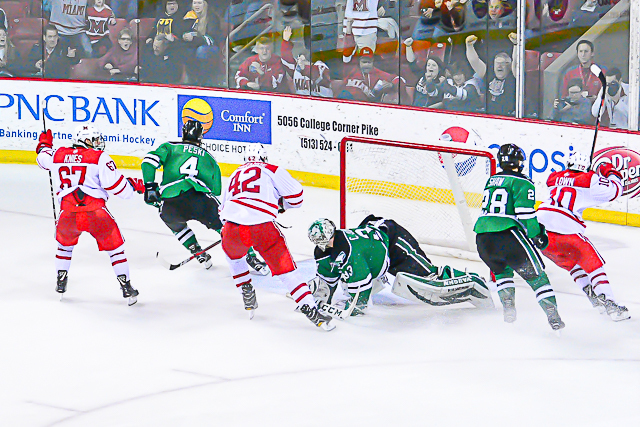 In addition to Melnick’s two late tallies, Providence scored a game winner against the RedHawks in the final second of the third period. 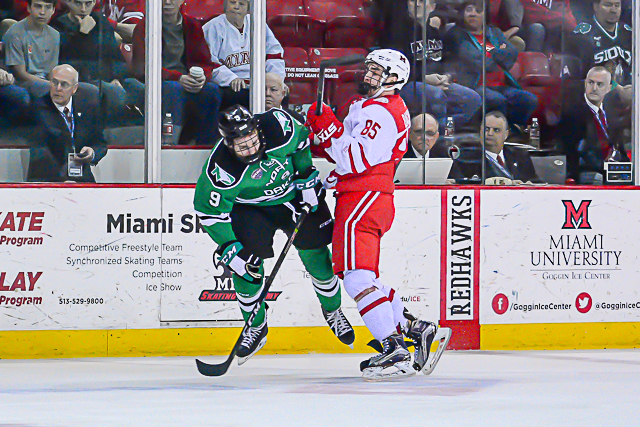 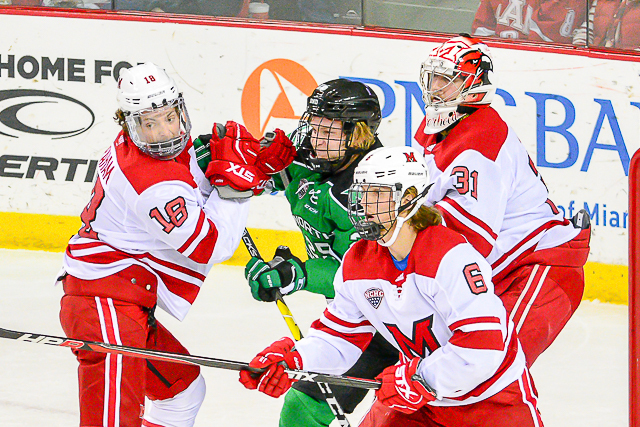 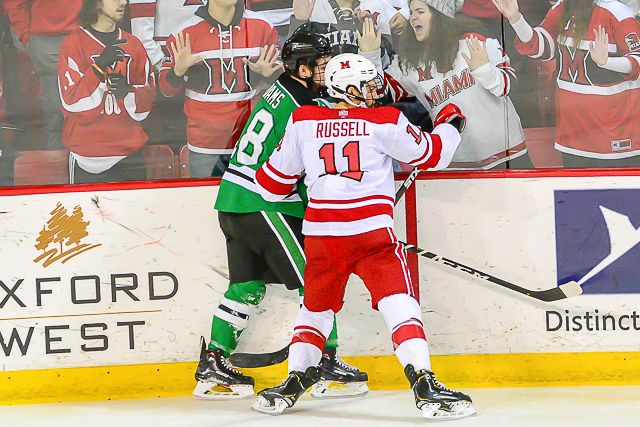 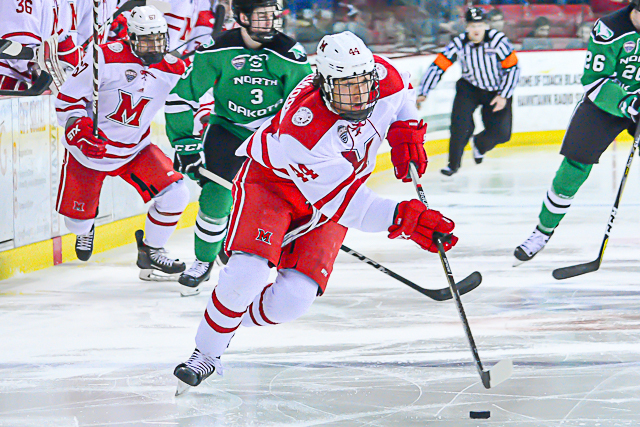 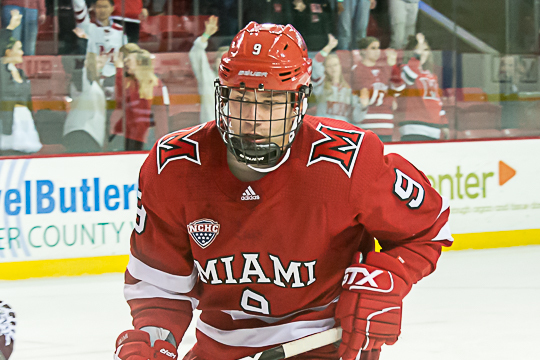 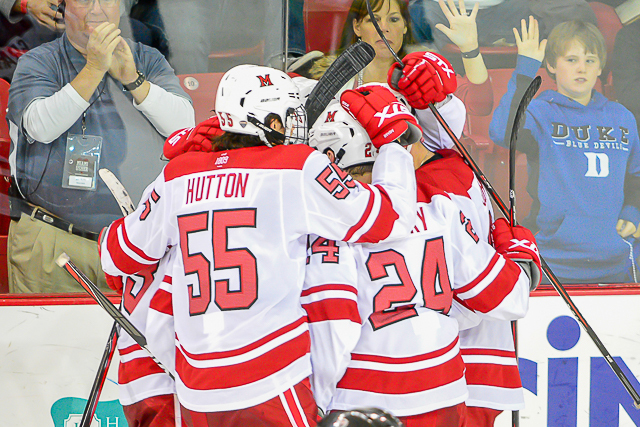 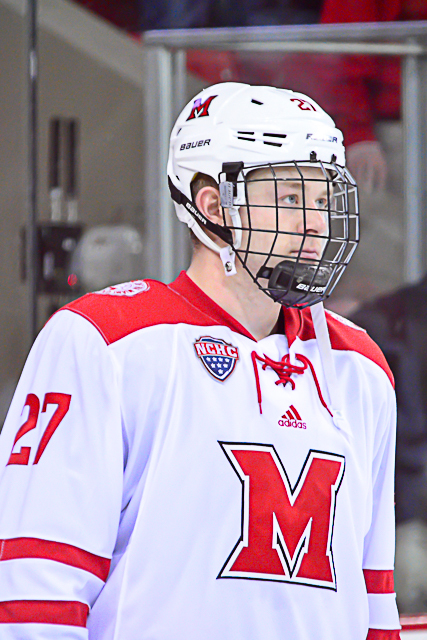 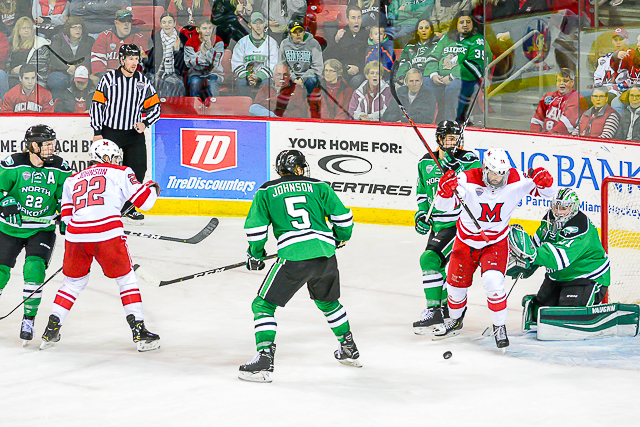 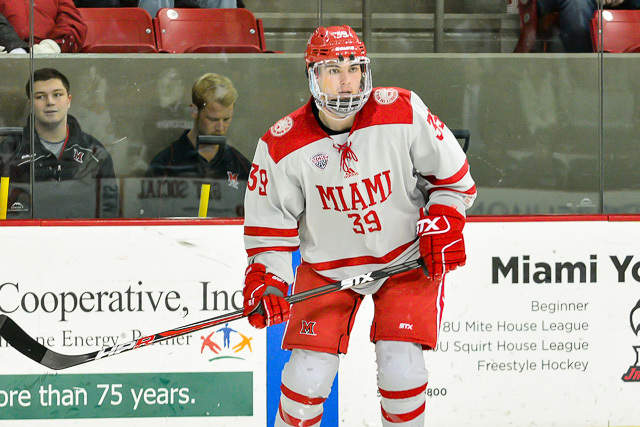 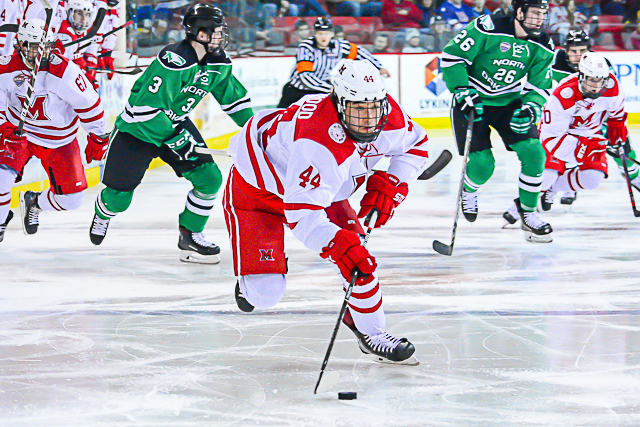 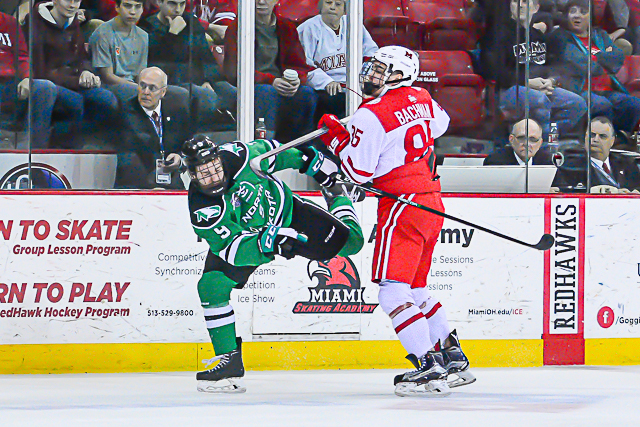 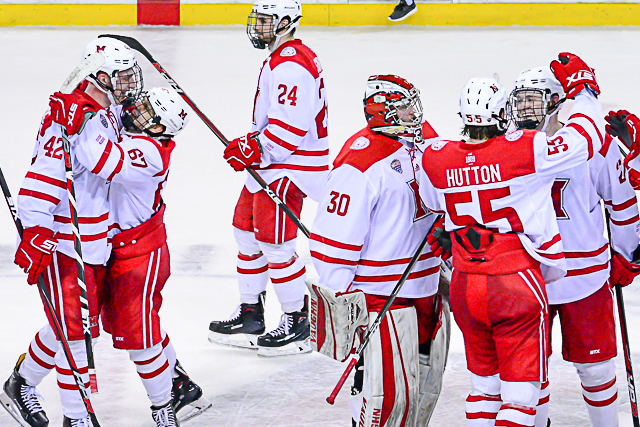 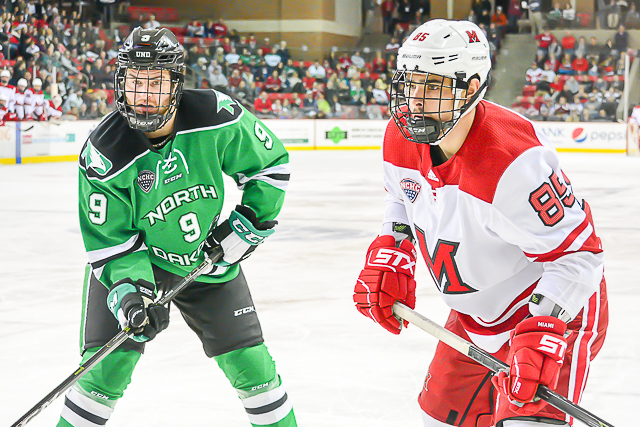 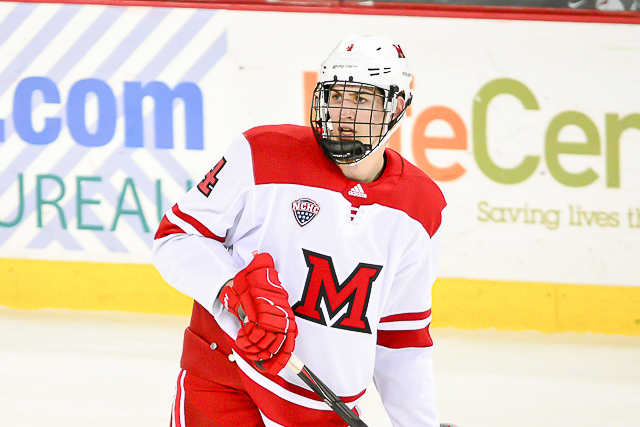 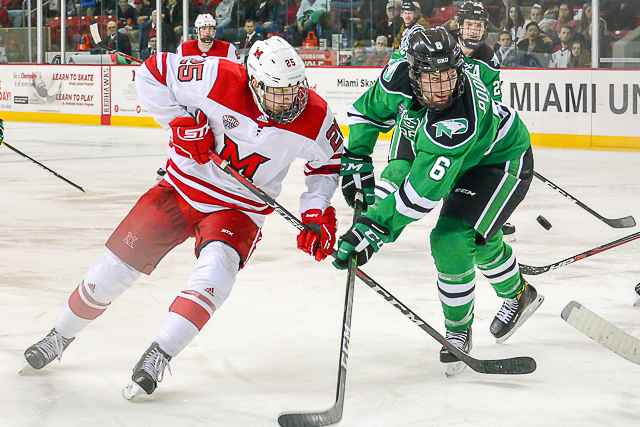 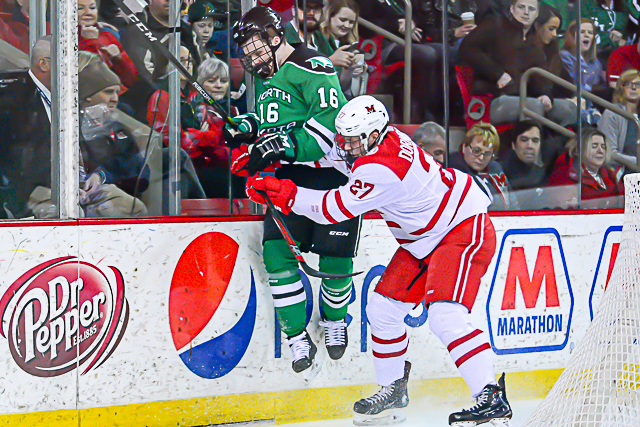 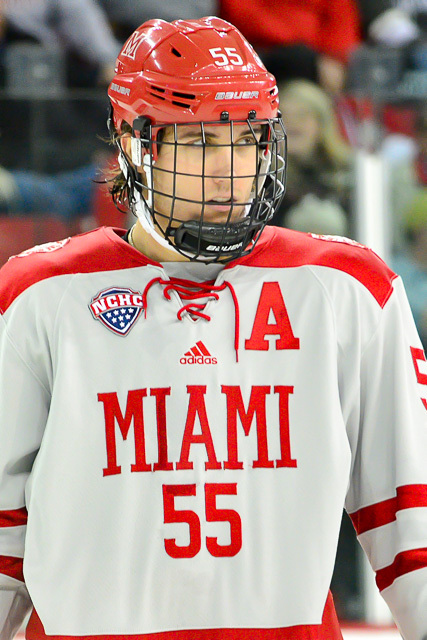 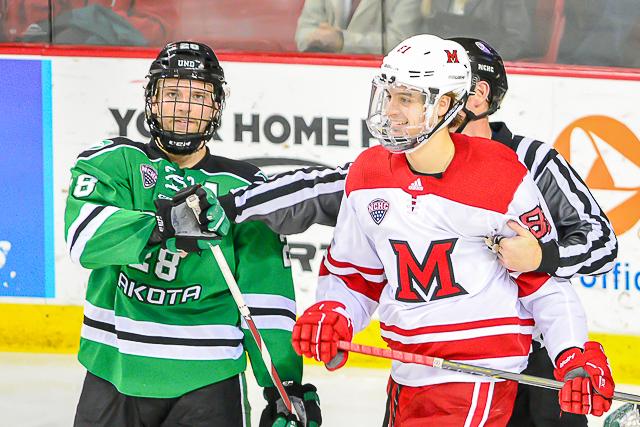 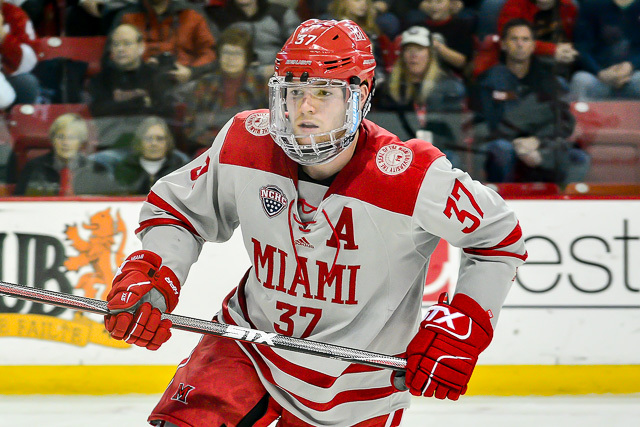 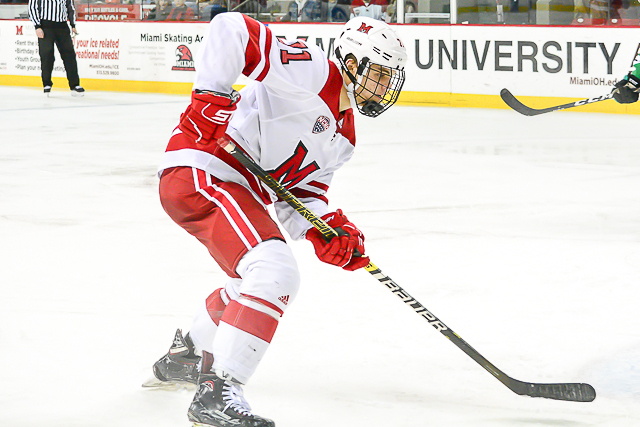 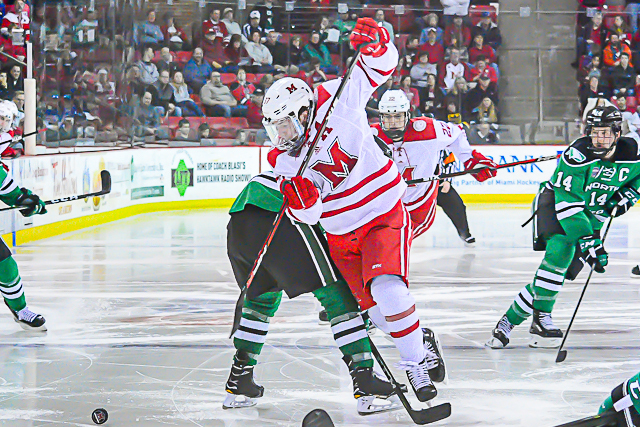 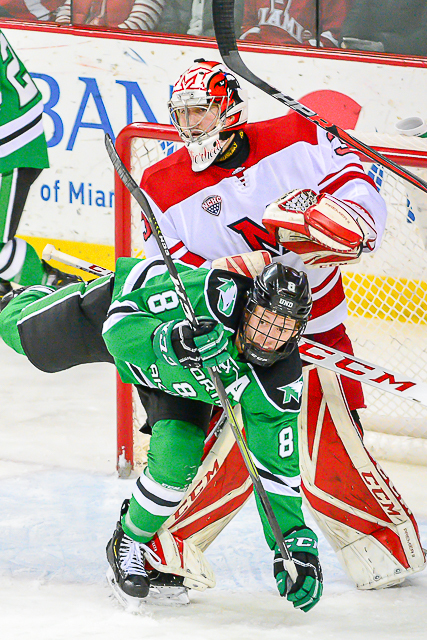 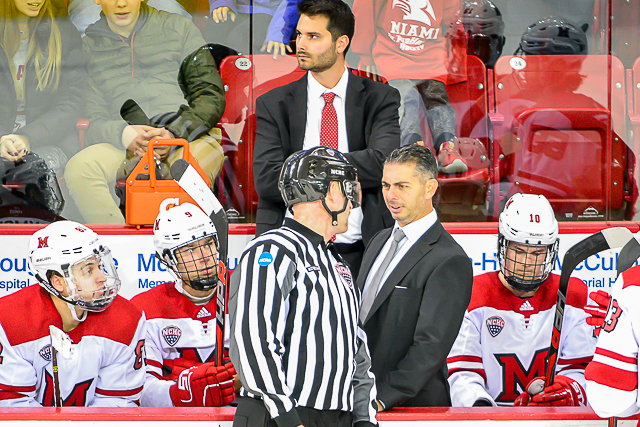 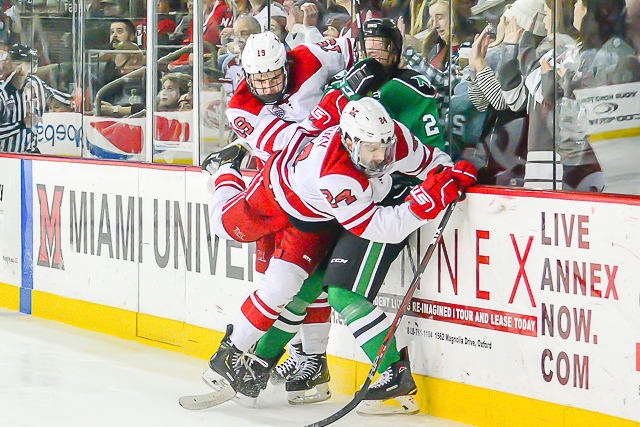 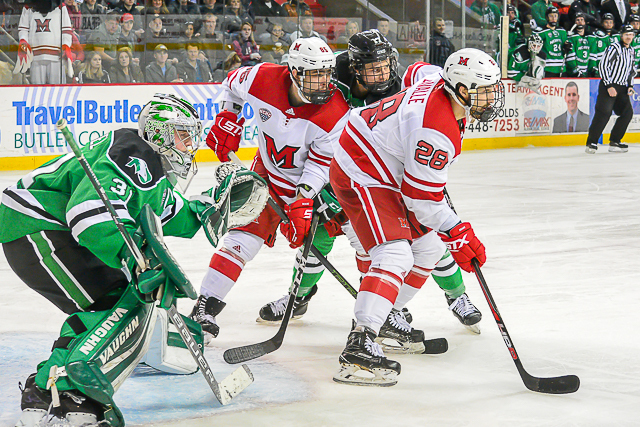 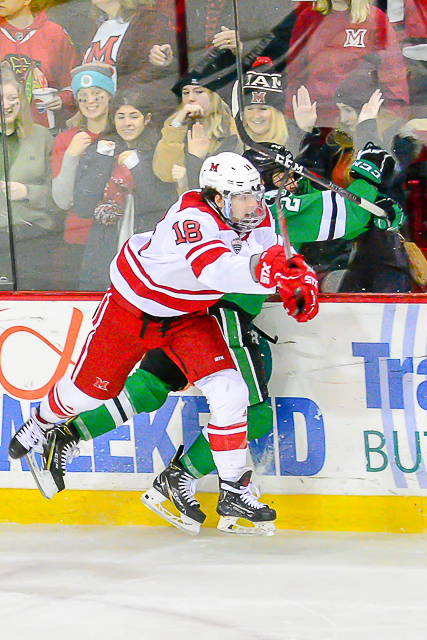 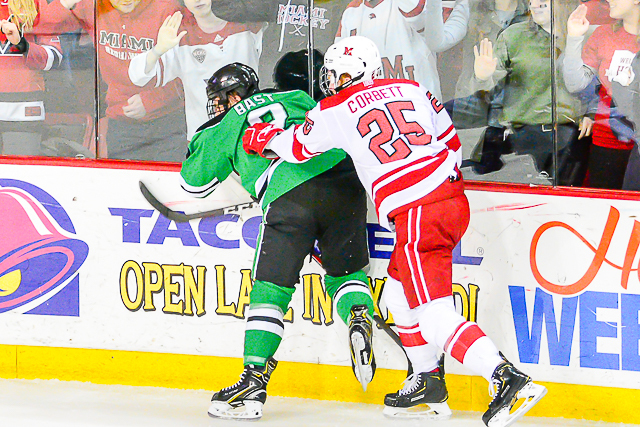 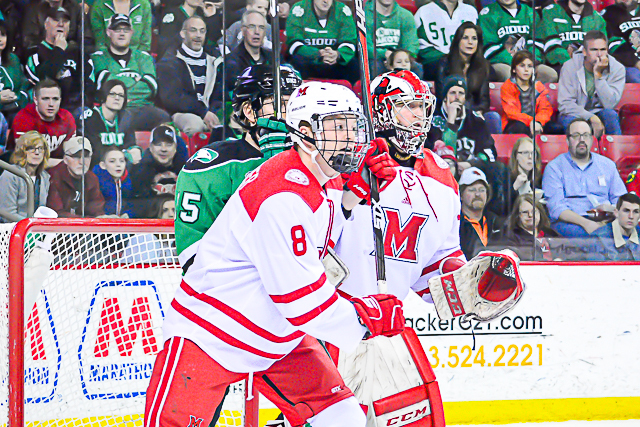 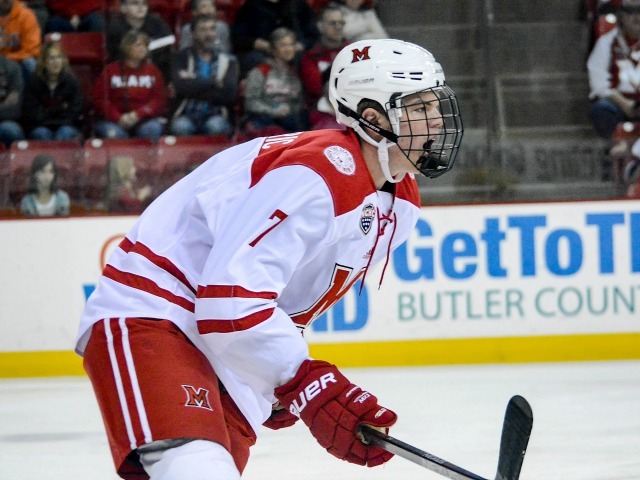 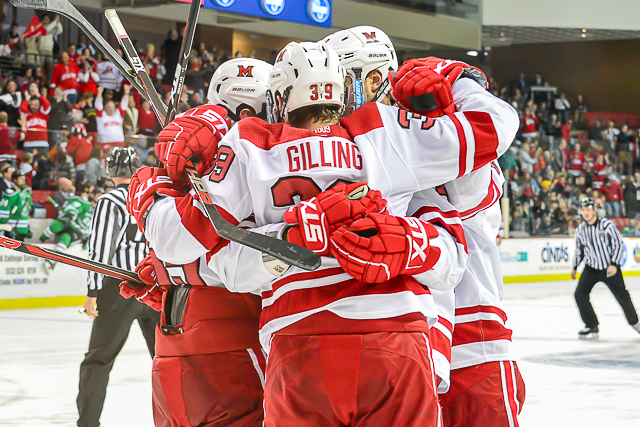 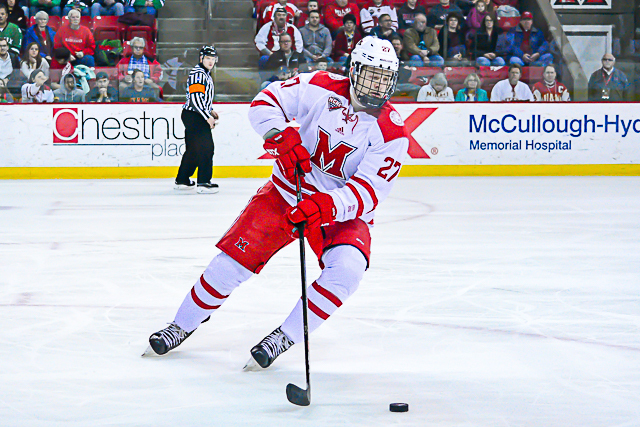 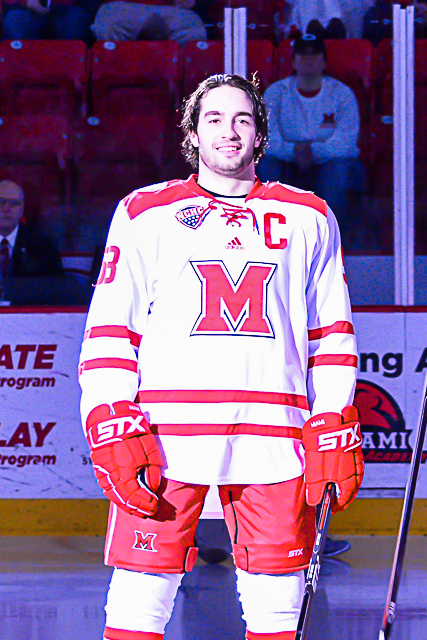 Miami is currently in sixth place in the NCHC with four conference points in four games. 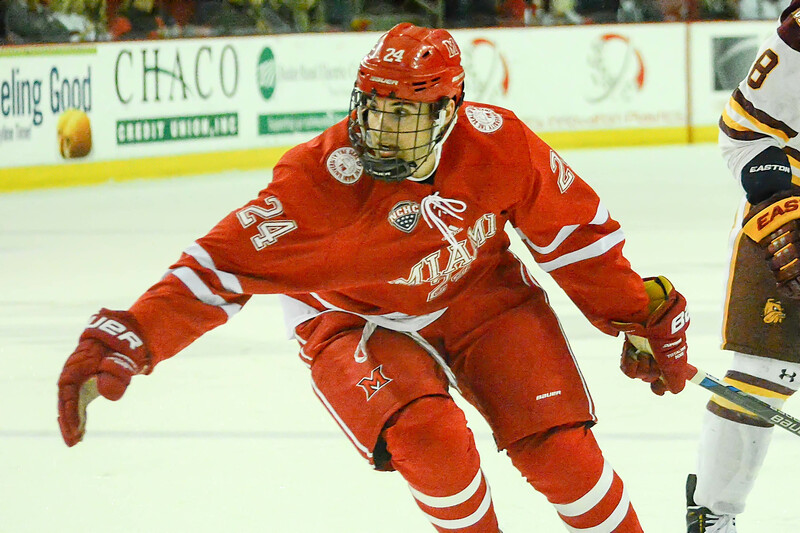 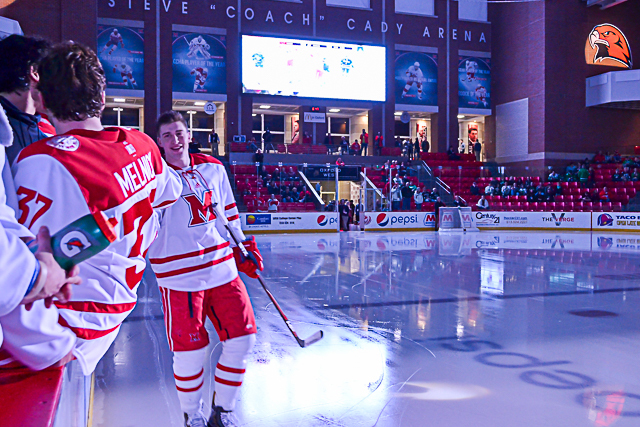 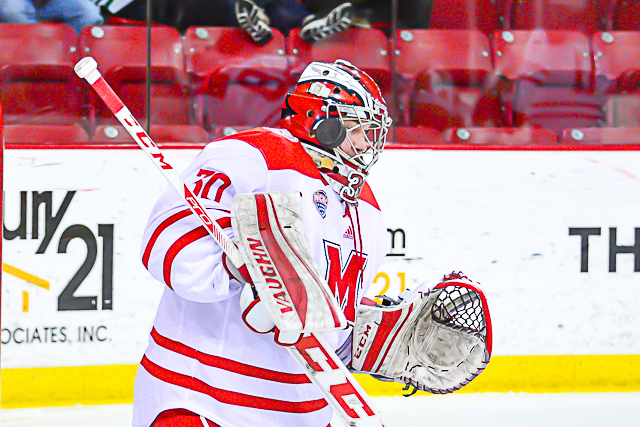 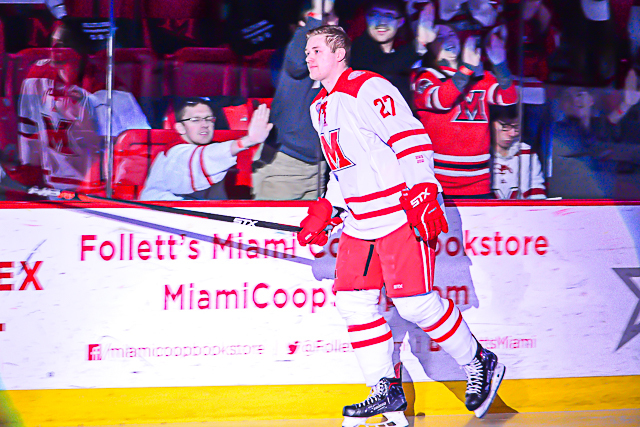 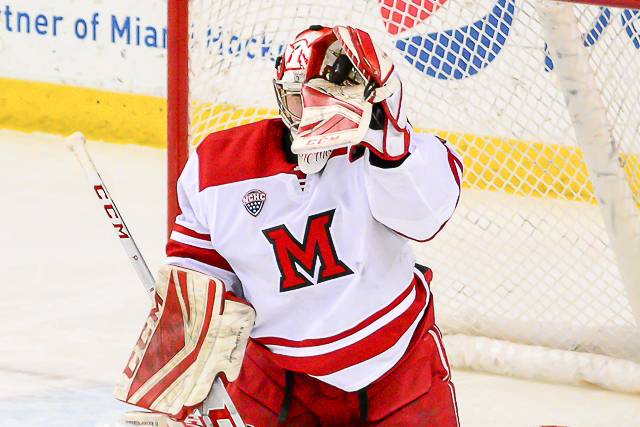 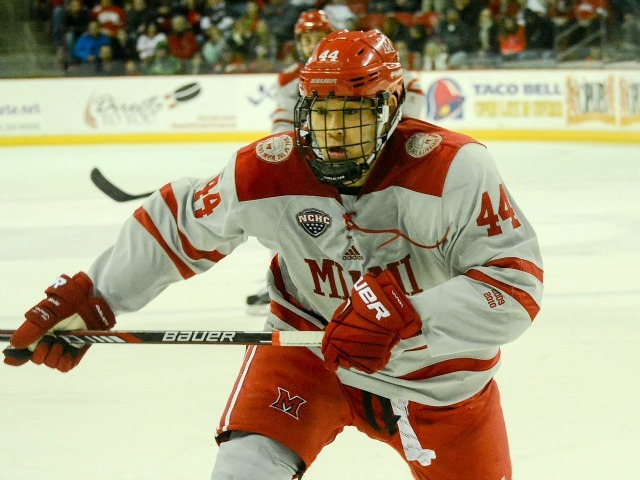 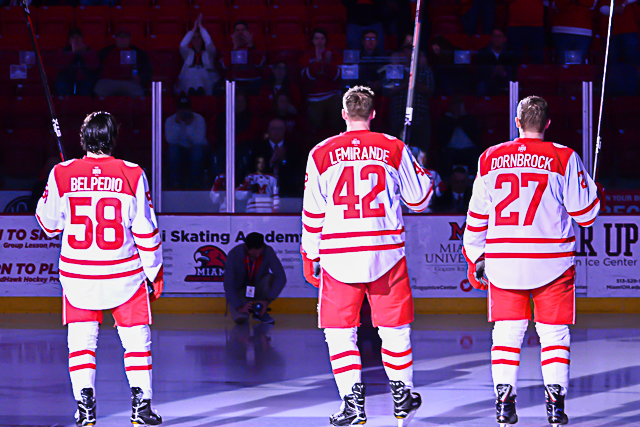 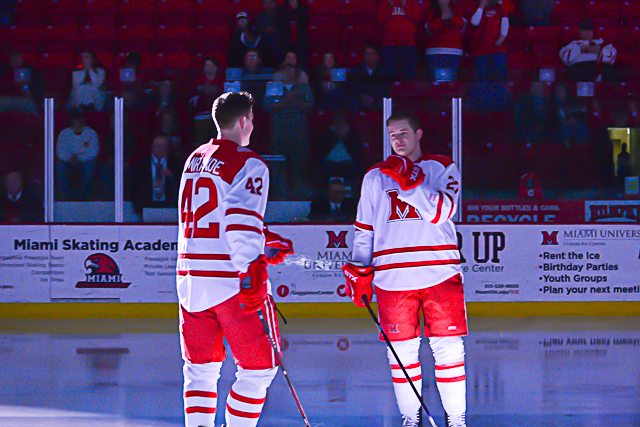 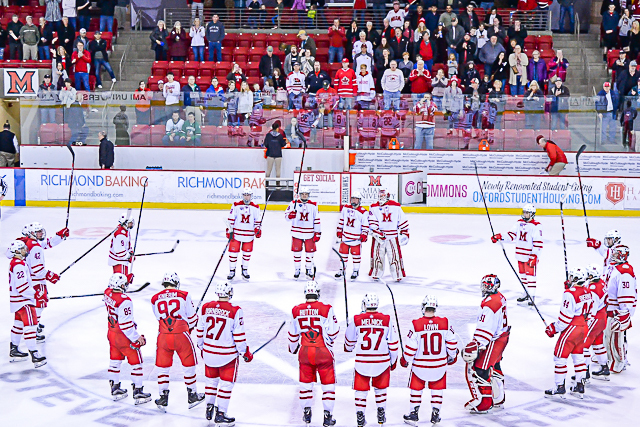 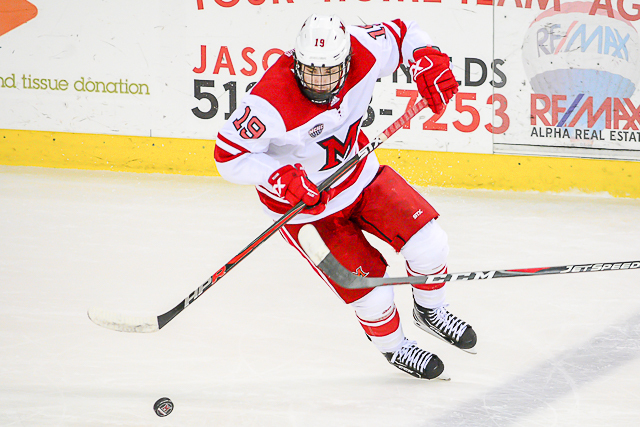 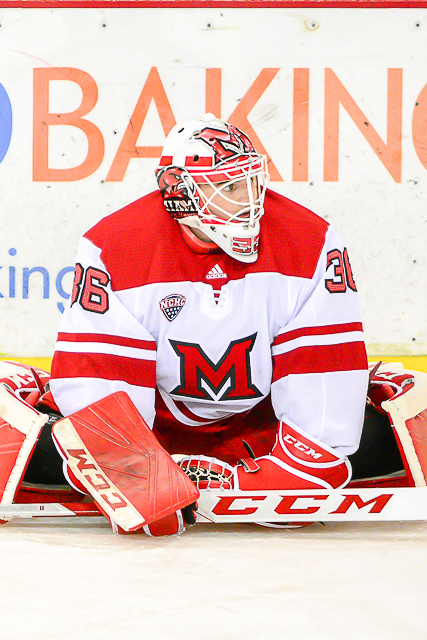 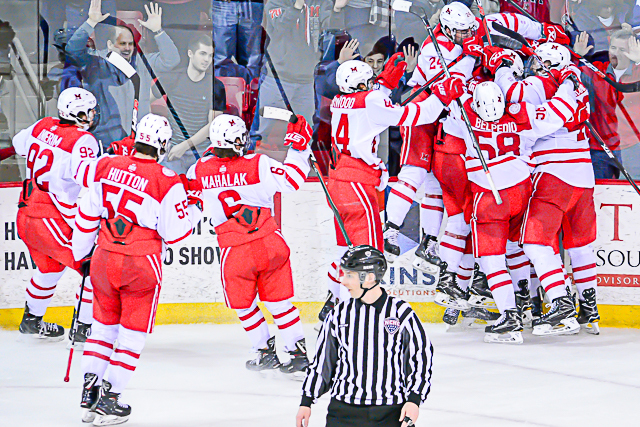 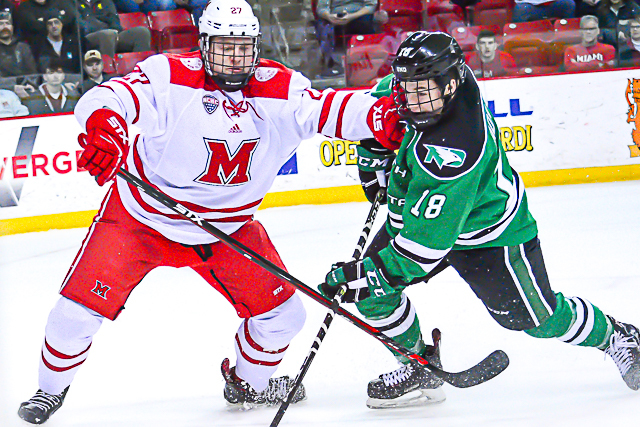 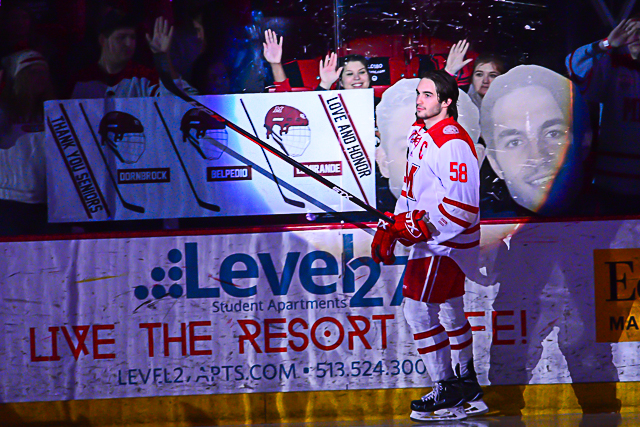 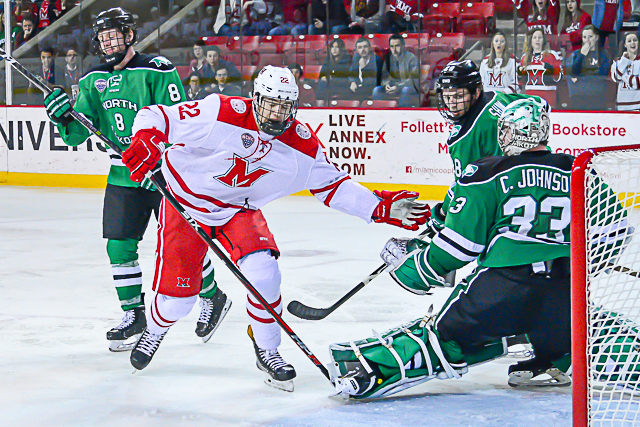 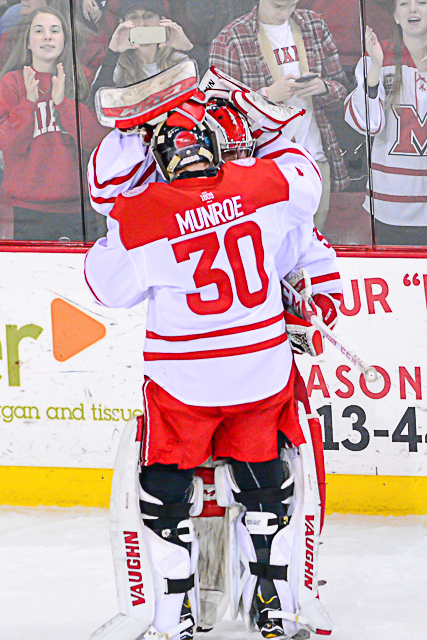 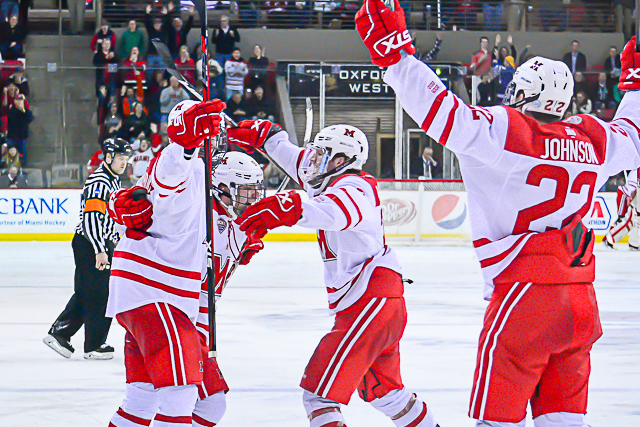 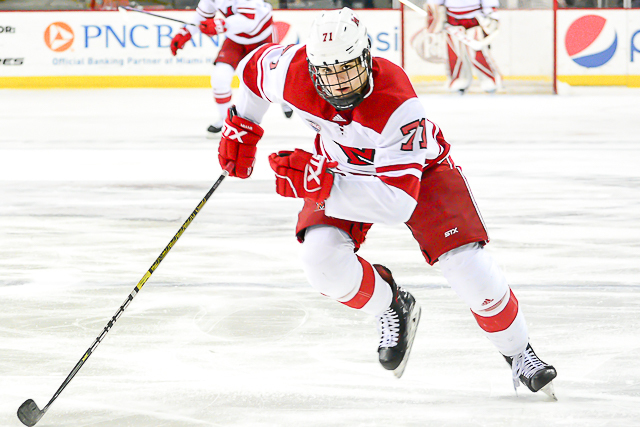 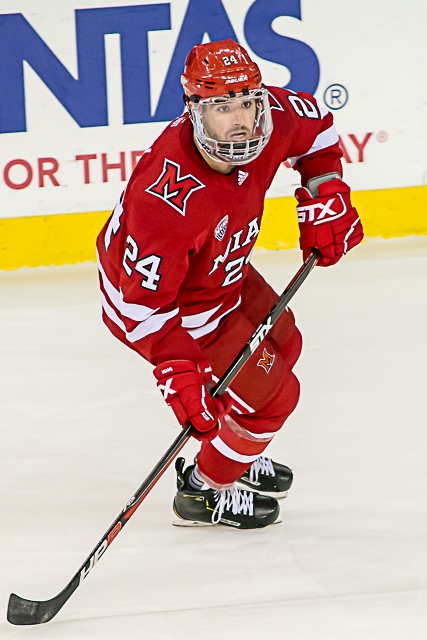 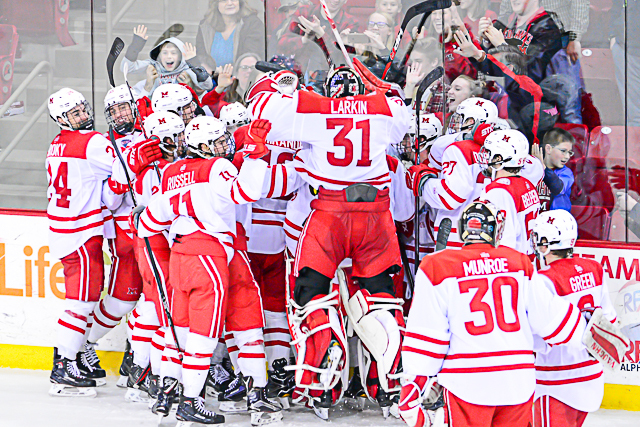 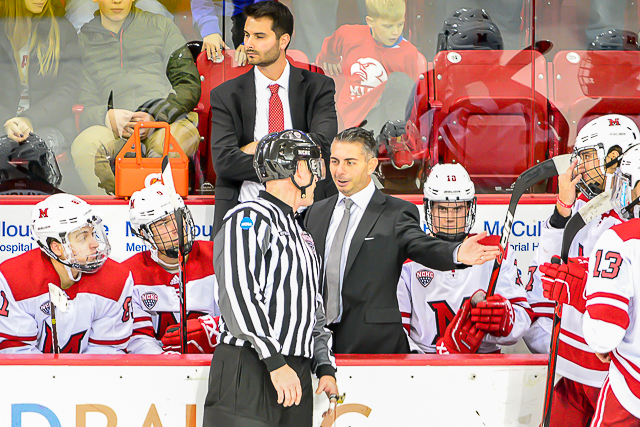 The RedHawks return home to host Minnesota-Duluth next weekend.